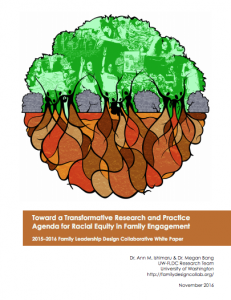 We are happy to share “Toward a Transformative Research and Practice Agenda for Racial Equity in Family Engagement“ with everyone. This report emerged from the data gleaned through discussions between FLDC members about the challenges and possibilities for racial equity in family engagement during our September and December convenings in 2015 as well as conversations in January and February 2016. We sought, in our conversations and our analyses, to embrace the inherent contradictions and tensions as generative opportunities to expand our collective understandings and vision of transformative possibilities. We hope you take a look and look forward to your comments!